What was different with the albums? Using the image below, the original 1972 album cover is shown on the top. When you compare old and new, you notice that the color of the lettering went from orange to red. The old album cost .25¢ and the new one went up to a buck. 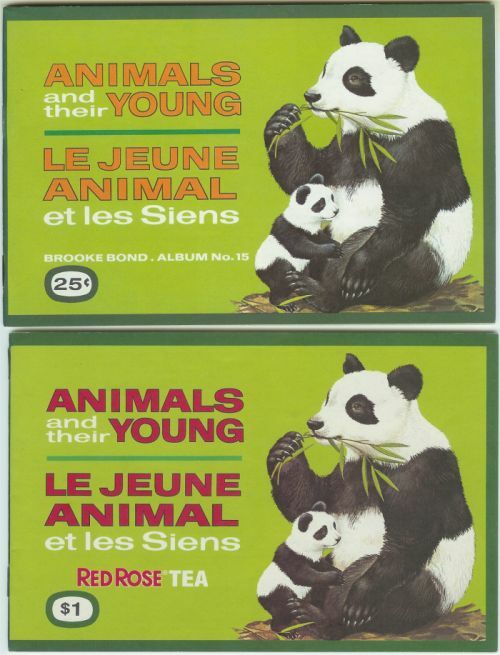 The last thing of note is that the original said "BROOKE BOND. ALBUM No. 15" while the 1990 version said "RED ROSE TEA". If you prefer to overlay the two images instead of looking at them side-by-side (or top-to-bottom) then you can look at the image on the album variation page. Is there anything different to collect with the albums? As far as I know, there is only one variation of the 1972 album. Although the same can be said for the 1990 album, you will find that you can find a lot of the 1990's with an interesting common feature. If you look at the $1 price, you will occasionally note that it has been slashed out with a magic marker. Now anyone can wield a magic marker, but if you look for them, you can find quite a few with this "affliction". Who cares? Well, I do. That's because I mentioned this to someone with ties to Red Rose and they told me that near the end of the promotion Red Rose decided to give away some of the albums. Before they did this, they wanted to show that the albums had been given away for free so they slashed the price with a magic marker. Since I have to have everything collectable dealing with Red Rose and there were a lot of these slashed albums, I have slashed albums in my collection.